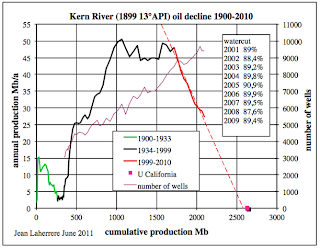 Last week, when I was writing about the heavy oil fields of California I used a plot from Jean Laherrère to illustrate the potential ultimate production from the Kern River oilfield as a way to illustrate its potential future. 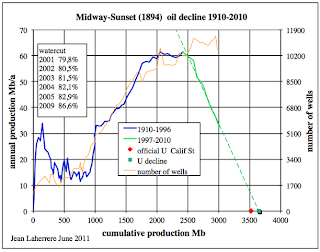 Jean has written, via Luis de Sousa, to point out that the curves that I used are out of date, and was kind enough to send along the more up to date curves, not only for the Kern River, but also for the Midway-Sunset field which, as I noted, is the largest remaining field. 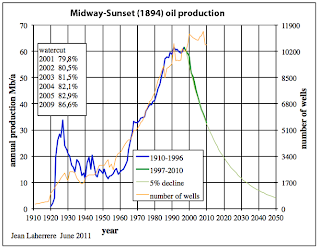 It seems to be to good an opportunity to miss to also take this opportunity to briefly discuss the basis on which these projections are made, since they allow an estimate of the ultimate oil recovery from a field, and a projection, as the following figures show, of when the field will effectively run out of oil. 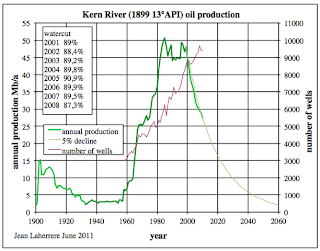 Let me start by putting up his figures for Kern River to facilitate the discussion, and then I will explain, and add the Midway-Sunset plots at the end. Jean has (since the initial post went up) written to point out that it is important to note that, despite oil price increases and more wells, the field has steadily declined in production, at a rate of about 5% pa, since 1998. Figure 1. 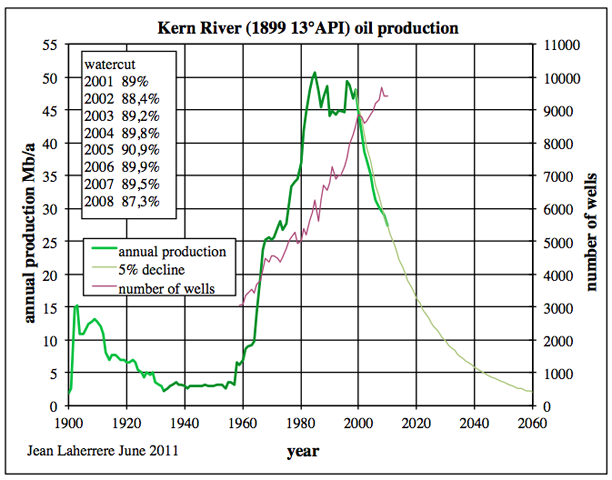 Past and projected future production from the Kern River oilfield in California (Jean Laherrère). This projection of field decline involves an estimate of ultimate recovery from the field which is derived from this curve. So how are these plots derived? Within the pages of TOD Stuart Staniford had briefly explained it while comparing different methods of estimating future production back in September 2005, with a follow-on post looking at specific examples where it might be applied. The technique derives from a process known as Hubbert Linearization (after King Hubbert, who is largely remembered for predicting the date of peak oil production in the US before it happened). 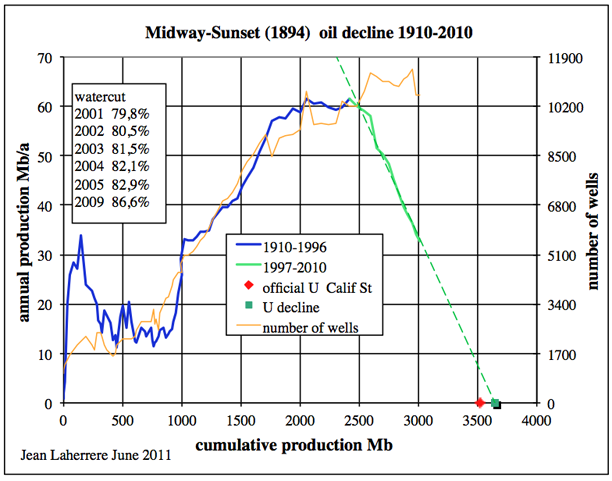 Examining the data from oil production over time, Dr Hubbert postulated that it followed a logistic curve, which as Stuart pointed out, is an accepted model of how exponential growth occurs in a system that is of a certain finite size. It has been used since its original discovery in 1838. Here, Q is the cumulative production as a proportion of the ultimately recovered resource, t is time, and k is a constant that sets the width of the peak. The solution Q(t) to this equation is a sigmoid function, and the derivative is the famous Hubbert peak. The idea behind the equation is that early on, the oil industry grows exponentially - the annual increase in production is proportional to the total amount of knowledge of resources, oil field equipment, and skilled personnel, all of which are proportional to the size of the industry. Thus dQ/dt is proportional to Q. Later, however, the system begins to run into the finiteness of the resource - it gets harder and harder to get the last oil from the bottom of the depressurized fields, two miles down in the ocean, etc, etc. The Hubbert model assumes that all of this complexity just comes down to that annual production gets an extra proportionality term of (1-Q) - the amount still to produce. So we plot the ratio of annual production to cumulative production to that date, versus cumulative production. In his book, Deffeyes does this on p37 for US oil production. In the beginning, the data are crazy, but after about 1958, they settle down into pretty much a linear regime (with a little noise) that has held good ever since. The nice thing about this method is that you do not need to input an estimate for the URR. Instead, you extrapolate the straight line, and it tells you the URR. 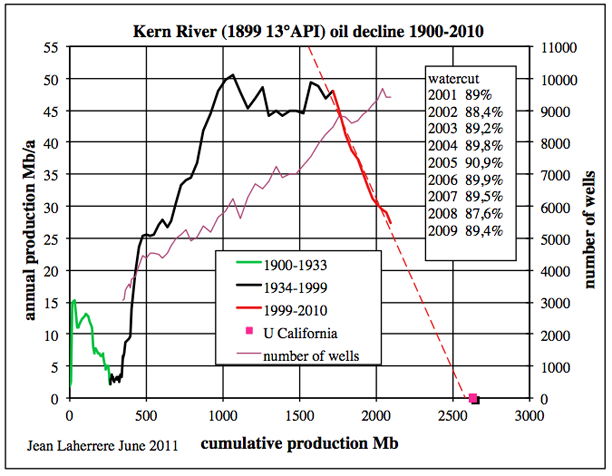 You will note that Figure 2 shows this for the Kern River field, with the extrapolated out to an Ultimate Resource Recovery (URR) of around 2700 Mb of crude. One can then project out the decline in current production (Jean notes that it remains at around 5%) with an estimate of how long the field will last. (Figure 1). The technique has some limitations in fields that are produced under political control, or due to other external forces where production can be shut off for significant periods (one thinks of Saudi Arabia, Iraq and now Libya as examples) however when political constraints are removed (such as for example in Texas) then the decline does assume a linear trend. It does not, however, always apply, and Robert Rapier has explained, in two posts (here, and here) why he has concerns about using the technique. But in terms of giving a ballpark for production (and recognizing that there are always new discoveries and inventions that can be, as they say, game changers) the technique has considerable support. And the consistency with which the Californian fields are following the predictions provide evidence for such an opinion. Figure 4. 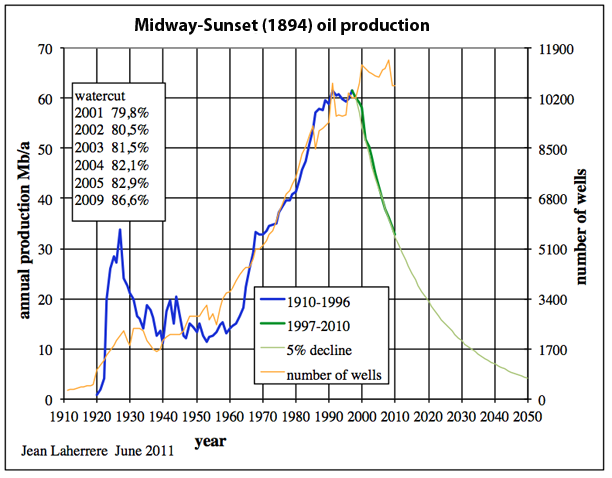 Past and projected future production from the Midway-Sunset oilfield in California (Jean Laherrère). I am deeply indebted to Jean for making this updated information available, as well as his indefatigable work in examining the remaining oil reserves in the oilfields of the world. P.S. Jean has also discussed results from this region in other material, such as, for example, here. Don't be too upset because I am only interested in doing the math and science correctly. Maybe you want to correct some of the misapplications of Hubbert Linearization and try again. On the part of rich countries there is excessive zeal for protecting knowledge through an unduly rigid assertion of the right to intellectual property, especially in the field of health care.sedotan plastik At the same time, in some poor countries, cultural models and social norms of behaviour persist which hinder the process of development." It is very nice drink, i love this.How apple pay works with passbook? This post is super post and very informative for me. Thanks for shearing such a sweet post. Thanks a lot very much for the high quality and results-oriented help. I won’t think twice to endorse your blog post to anybody who wants and needs support about this areaSoba Pobega. I find your blog Informative. You will love these Articles On New Year 2016. That is the excellent mindset, nonetheless is just not help to make every sence whatsoever preaching about that mather. how,Use other parts of the body - If your leg is injured, try working out in a when is it worth it to refinance your mortgage, lifting down payment on new Key safes arms to help you still move and increase your heart rate. Whatsapp Quotes,Whatsapp Wishes,Whatsapp Messages,Whatsapp Jokes,Whatsapp SMS,Whatsapp Images,Whatsapp Wallpapers,Whatsapp Status Videos. Which You Can Use As Your Whatsapp Status In Your Whatsapp Profile,This Website Is Not Affiliated To Whatsapp Inc.
Nice Status For Whatsapp . Sweet Status For Whatsapp . This is a promotional portal for Kerala State lotteries(Govt Of Kerala) ticket buyers and sellers. We are providing better and simplified data and services to those people who are buyers or sellers of Kerala state lottery. Karunya Lottery,Today's Kerala Lottery Results,Yesterday Kerala Lottery Results,Next Bumper Lottery results of the lottery within 30 minutes of the draw happens though we dont guarantee the timing. We are here by disclaim that we are neither associated to Government of Kerala or any Lottery Agency. HERE YOU CAN GET Kerala Lottery Results .